At the far end of the Trinity Fields stands the House of Order of the Sable Moon. 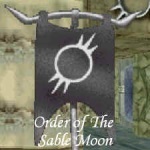 The Order of the Sable Moon is an OpenSoul Imprisoning house, that recognizes the great amounts of energy not only in Mares, but in and around the dream. They utilize this strength to work toward their goals as a house and to support each individual growth. The Order of the Sable Moon is an Enlightened FreeSoul House. In this light, we believe that the waking world has no direct effect on the Dream (and vice versa), however some indirect effect is possible and clearly seen through the thoughts and emotions that we carry between our waking bodies and Dreaming Avatars. We do not understand the dread nightmares, but know them to be a great disturbance in the Dream. We seek knowledge of them, that we might discover the means by which we can destroy them, enslave them, remove them from the Dream, or end their threat through non-violent means. We do not claim to know which of these options will be the final solution, but believe that through our efforts we may one day make that determination. In order to further these efforts, we collapse nightmares and imprison their essences. Since we are not a house of SoulMasters (who may learn the art of 'imprison nightmare'), we utilize the artifact forged by the Dreamsmith Cybele, the Sable Sphere, as our forefathers did before us, to imprison the essences of the nightmares for further study. The house started out as just another FreeSoul house. Later the belief changed to Enlightened FreeSoul, which means that they accepted that some of the emotions and thoughts may carry over to the waking world with the dreamer. The Order of the Sable Moon. Yes, that is what we are, but, what does it mean? What is the history of our house, the foundations upon which our rich family structure was built? What are the roots of the house, that makes us what we are? Many might simply answer, “The Trinity”. While Bajo, Medio and Gato do play a large part in what our house is, there is so much more to it than that. To simply refer to our house as an extension, or continuation of the studies of the Trinity, would be to do a great disservice to the several who have lived, and spent their lives and dreams in service to the Order. The Order was built, as were many houses, during the Dreamer Wars. At this time, before the existence of mares, the houses were mere clans, joined together due to similar beliefs in FreeSoul, or Illumination. At this time, the Order was a FreeSoul house. However, unlike their neighbors, the House of Calenture, the Order was more devoted to study, than the useless theoretical arguments and battles over who was right, in an argument that might never be resolved. Instead, while the Order was firmly seated in its FreeSoul beliefs, it opened its doors to all, for the study of the Dream as a whole. It resembled a monastery of sorts. The walls were bare stone, as decoration provided distraction. The monks were vested solely in brown robes to match the stone, so that all would be equal. There was no hierarchy, such as the Rulers, Guardians, and Initiates that we have now. They lived in equality, and peace. At the beginning of the Dreamer Wars, a group named the Srechethan Kabal had tried to attain a stockpile of items, and take over the dream. They were defeated at the Battle of Sunroof Cavern. Unfortunately, though the battle may have been won there, the group was far from defeated. They went into hiding after the battle, but slowly reformed, with a new target, and a new path to power. Slowly, the Srechethan Kabal infiltrated the Order, posing as fellow monks, taking up residence. For weeks, members joined the Order, under the guise of peace, and wishing to study with ‘fellow FreeSouls’. Then once the numbers of the Srechethan Kabal outnumbered those of the Order, they wrested control of the house from the monks with a concentrated strike, and took over as the new leaders. The placid monks were caught by surprise and, were completely unprepared. Ever dutiful to their studies, though, they quickly formed what meager resistances they could, to try to protect their research, notes, and projects. They fought furiously, trying to protect all that was dear to them. Unfortunately, those that chose to fight were collapsed quickly. The battle itself was over in a matter of minutes. The clean walls were now scarred by chakram fire, essences lay scattered all about the floor, falling among the codecii left laying about. Thus began the dark period of the house. Everything that the monks were, the Srechethan Kabal was not. Ruthless, vile, and materialistic, the Srechethan Kabal were the most despicable bandits in the dream. However, they too realized the value of study, and knowledge. Rather than kick the monks from their home, they allowed them to stay. However, no longer were they treated as equals.The monks lived only slightly better than slaves. They worked day and night, tirelessly, under the endless dictates of the Srechethan Kabal. Anyone else would have left, but their devotion to their studies, which they were allowed to continue during their free time, kept them tied to the house. The Srechethan Kabal used the monks’ devotion to study to their great advantage. They soon became the most advanced house in the dream, having the monks researching new arts constantly, and gathered an immense stockpile of items. They developed a network of spies, to know everything that was going on in the dream at any given time. Their spies spread to every house, or group in the dream. As the Srechethan Kabal continued to try to extend their iron grip throughout the dream, they grew complacent in their actions at the house. As their holds on control of the other houses grew, so shrunk their control at their own house. The Order had become very influential, controlling several of the other houses, in fact. Yet, hidden even from the Rulers of the Order, a revolt was brewing below them. The monks had grown hardened by their time of servitude. Their soft, supple hands that had once tended only to books, and manipulation of items, had become firm, strong, and scarred. Their placid lifestyle had been replaced by one of constant, backbreaking labor. Yet, through all of the pain they endured, they continued to grow stronger. Cybelle, as with the other monks, had been allowed to pursue her studies in her free time. Her studies had been of the creation of items. She had studied elemens, chakrams, and generators for endless evenings, returning to work many times without having rested. Soon, she had learned the secrets to the creation of items, and set about on her first project, a large sphere for them to store essences of mares in, for study. Cybelle forged her Sphere, much to the amazement of the other monks. But Cybelle had a dual purpose to her creation of this artifact. Through her research, she had found that each individual essence that was formed, contained a small degree of residual power. As she forged the sphere, she created it so that it not only stored the essence, but siphoned the power, making the artifact stronger, and more powerful. During their free time, the monks began sneaking off, to gather essences. They would take the essences, and store them inside the sphere, then return back to work. The Srechethan Kabal ignored their outings, assuming that the slaves were merely taking their free time to rest. The monks began to gather more and more essences, to build as much power as they could. when, one day, when the Srechethan Kabal were coming to round the monks up to work, they met Cybelle, standing at the head of the crowd, holding the Sphere. Cybelle looked at them sternly, and demanded that they relinquish the house to them, much to the amusement of the Srechethan Kabal leaders. Amidst their raucous laughter, Cybelle raised the Sphere in front of her, and began draining it’s power into her, through her! The Srechethan Kabal leaders could only watch in stunned amazement as the power surrounded the monks, empowering them. Then, with a roar of rage, brought about by years of servitude and degredation, the monks charged. The Srechethan Kabal put up a token resistance, but soon broke and ran. Triumphant shouts rang off the walls as the monks celebrated their newly won freedom. Cybelle took over as the leader of the Order of the Sable Moon. They still held to their beliefs that all were equal, but they had also learned from their mistakes in the past. Their time as slaves had brought about a closeness within the monks, making them more a family, than as simply a house. By this time, the Trinity Bretheren had came and gone from their brief, although influential, stay in the dream. It was to the legacy left by these brothers, that the Order now looked to for inspiration. It was common knowledge how they had created Imprisonment, Banishment, and Enslavement. Cybelle herself had been able to sneak away from her labors long enough to see their presentation (thus, how she learned Imprisonment, and create the Sphere). It was also known, that they had discovered none of the processes to work, and had begun work on a 4th process.. one which had been developed, before their untimely demise. It would have to be rediscovered. The Order adopted this cause as their own. The house became devoted to the study of essence, in the spirit of the Trinity. Their purpose was to find the correct way to deal with the essences, that which the Trinity had found. Their time in servitude had made the monks tougher, stronger. Now, each could wield a blade, and had physical strength to match their mental prowess. Their house quickly became one of the strongest, and most devoted in the dream. Cybelle knew that in order to prevent a take-over from ever happening again, the Moon would have to have strong leadership. She herself took the mantle of Rulership first, the beginning of a line of strong and faithful rulers. She picked Guardians from those she believed most devoted to the house: Tarik Dahran, a jovial FateSender in love with a woman named Aya. Helga, a young maiden in love with Tarik. Caladar, a thoughtful and warm-hearted leader. Ellie, a freedom-loving young SoulMaster. Richard, a strong and devoted FateSender. And finally, Gilda, an insightful and ever-curious DreamSeer. The Order grew strongly in this period, devoted to study. Slowly, many the Guardians became Rulers, allowing Cybelle more time to divulge in her studies. The House stood through the remaining time of the Nightmare Wars, proving to be a beacon of strength that the other houses turned to for support. A young dreamer named Higi proved to be very useful during this period.. one of the most devout Mare hunters, he seemed to know every place that they were going to strike, and was always there to defend his honor and his house. He claimed that he had an advantage over many of the hunters, due to the fact that the Srechethan Kabal had sent him to study with the Entropy Coalition during their occupation of the Order, and he knew the makings of mares better than anyone. Unfortunately, this soon proved to be all too true. As days passed, the Order continued growing. Rulers Richard and Gilda were married, and they adopted a son, Az’ryl. As Az’ryl grew, he became close friends with Higi. When Richard and Gilda stepped down as Rulers, they sought to seek the permission of the other rulers to have their adopted son take their place. As Az’ryl showed true promise as a scholar and had been groomed well in the political dealings from being raised by Richard and Gilda, the proposal was granted, and young Az’ryl was made a Ruler. Due to their close friendship, one of Az’ryl’s first acts was to grant Higi knighthood in the Order. And as the Order grew stronger, calamity struck the dream. One day, Az’ryl received a missive from Higi, warning him of a group, meeting for some lost purpose. Az’ryl was sure that it was the Entropy Coalition. He never doubted for a second Higi’s loyalty. Az’ryl snuck in, and watched the ceremony unfold; cloaked figures gathering around the middle of the room, candlelight flickering along the walls, and an unholy feeling wavering around the entire area. Then, as the ceremony began, a figure pulled the cloak off of his head: Higi. Higi had never stopped working for the Entropy Coalition. Once the Srechethan Kabal had sent him there, he in turn had been recruited as an agent for the Entropy Coalition. He had returned, and won complete support in the house, even become a knight. And he had hand-delivered one of the Rulers of the Moon to the Coalition. They captured Az’ryl, and began to summon a mare.. whether to posess Az’ryl, or merely to use his energy to perform the ritual, is not known, because as they drew power from the dream itself for the ritual, cracks began forming in the walls of the city, and Chaos rushed in. The Great Loss occoured. The Houses were all but destroyed, rifts cracked the dreamscape, and dreamers were washed from consciousness, lost to Chaos. The Order of the Sable Moon fell, along with all of the other houses in the dream. But as we had risen from the control of the Srechethan Kabal, we arose again from those ashes of the Great Loss. Gathering together and reforming to become even stronger, more powerful, and more dedicated to the dream, our studies, and ourselves. And that is the history of the Order of the Sable Moon. At the Order of the Sable Moon, there are several rooms made after the same design. These being the Patrol Room, the Teaching Chamber, and the Initiates, Guardians, and Rulers Meeting Rooms. After examining the walls carefully, I found that all of those rooms had common designs in the walls. These are not, however, random designs. If looked at for long enough, the true depiction becomes apparent, and the designs begin to take on non-abstract forms. But I am getting ahead of myself. First, a tale I have uncovered must be told. Then the murals themselves will make far more sense. Long ago, many years before the Great Loss struck our fair city, many years before the DreamStrike Coalition unveiled and used their dark art, the city was a bustling land of dreamers seeking the finer things of life. Enlightenment, knowledge, friendship, and of course the most important of all things sought, that of love. This was the time of the budding love of two respected Guardian dreamers of the Order of the Sable Moon, Curtwana and Pratnar. Curtwana, the SoulMaster, was the jewel of the dream, her beauty encouraging desires for her hand by all that saw her. Pratnar was a muscular young DreamSeer. His heart and mind a well tuned machine, constantly asking questions and seeking the answers. The two grew to love one another as their duties demanded they work closely together, each growing to find that each difficult assignment they underwent was less and less like work when they were together. Eventually, the were wed, and lived as a happy couple for decades, both finally arising to rulership. Time went on and their most striking physical attributes began to wane. Pratnar's physique slowly rounded, his step slowed, his stature grew a bit less straight. Curtwana's beautiful cole black hair began to show the signs of age, graying it in streams. Though their youth faded, their love grew only stronger to compensate. They were undisputed as the happiest couple to ever grace the dream. As the years continued to pass, they watched sadly as the city grew more and more wartorn. The outright warring of the houses disheartened them, and Curtwana was commonly seen weeping over the sadness itself. But the true sadness of this couple had yet to be seen. The art of DreamStrike was created, though it was very new, and word of its existence and capabilities had yet to spread to all corners of the dream. Curtwana and Pratnar were wandering the dream, slowly of course. As they stopped for a rest, they were startled by an entering group of warriors. They watched in horror as the chakrams began to fly about the room, and dreamers screamed out in pain. Curtwana stepped forward, pleading that they stop. Unfortunately, the battle shifted direction slightly, and she found herself in the middle of the onslaught. For the first time in decades, Curtwana was collapsed. Pratnar did not possess the art of Restore, as its ability to be learned by other foci was not yet fully understood. He watched as her soulsphere bobbed up and down, tears in his eyes. Then, the worst happend. The Dreamstrike Masters entered the room, word of this battle of the warring having reached their ears. They proceeded to DreamStrike all those they found that had shed their avatars, Curtwana included. A scream of sorrow, more powerful than any ever realeased in the dream before ripped through the room as Pratnar's heart was torn from him. He wept, knowing what he held to be his whole reason for living died before him. A monument, long since lost, was errected in her honor, and Pratnar visited it every day for hours at a time. He grew so distraught that his duties to the House fell to the wayside. The dream itself grew too painful, having to live it without his sole love. He went back a final time to visit the monument. He removed the chain from his neck which held his crest (the chain was used long before the crests were applied to our tunics) and carefully placed it upon her gravesite. The pictorial representation can be seen in each meeting room of the Order. Upon the wall can be seen an elderly man (Pratnar) staring sadly towards the room corner. His gaze leads to a pole, bent on the end and wedged into a stone base. Inside the hook rests his crest. From behind him, a cloaked figure can be seen. This is of course one of the DreamStrike Masters, rumor being that it was either Hartisan the Red or Turgin Lambent himself. This depiction was carved into the very walls of OoSM as a memorial to both dreamers and respected members of the Order. May their pain never be forgotten, and the circumstances that caused their pain never be repeated. The Order of the Sable Moon claims the rights to administer our lands as we seem fit. For future reference, the lands of the Order include all of Trinity Rise, Trinity Plains, Trinity Walk, and Trinity Fields. These are the lands that separate our House from Threshold, and as such, the path that all visitors must walk to gain access to our steps. It is our responsibility to ensure these lands are passable and safe. This is the same recognition we have always given to other Houses, and we expect no less. The Order maintains the right to protect any thinking creature on our lands, be that creature Dreamer or unique nightmare. We do not seek to harbor mindless beasts that senselessly attack others, in fact, senseless attack will be quickly dealt with by the most severe means available. The Order *will* respect the sovereign rights of the other Houses to control their lands as we will control ours. Lands that do not lead from Threshold to a House belong to no one House - We maintain the right to conduct our studies and follow the tenets of our beliefs as *we* see fit on these lands. The Order has always accepted escorted guests into our Home. Unescorted guests, regardless of form, will be dealt with swiftly and harshly. Additional time/warning *may be allowed* for unique cases, but the result is the same. To address the matter of unique nightmares specifically: We will learn a method to communicate our intentions to the 'mare. If the 'mare choses not to listen, we will deal with it decisively. As the nightmares are often childlike in their simplicity, perhaps they will understand a simple lesson using punishment and reward. This too can and will show progress in our studies - as an experiment in whether the 'mares will show us the respect we offer them. The hunting of aggressive, non - communicative dark nightmares will not be halted. However, any who hunt on the Trinities do so at our discretion. If asked/told to leave, they will comply without question, or be dealt with harshly. Don't bother. They don't need our help, and if they are friendly, and on our lands, they are protected anyway. They will heal. The cold glow of the lamps shone down as the three stood in front of their father, Lord Bahuji. Standing in a line, the soft light glinted off of their faces, all blank, and devoid of emotion. The tallest one, known by the name Gato, absentmindedly brushed a lock of his dark black hair out of his face, and looked up at his father patiently. Medio, the aptly named middle son, shifted restlessly, anxiously awaiting the reason why their father had called for the assembly. Bajo, as usual, stood there beside his brothers with a rather detached aire, not caring why they were called at all. Bahuji stood from his throne, with a stern look on his face. The head scholar of the tribe stood beside him, his face enshrouded within the darkness of his cloak. Bahuji looked at his three sons, the light glinting off his golden crown as his gaze moved from one to the other. Finally, he spoke. "Gato, Medio, Bajo, I have called you here today for an important reason. You have all came of age, and as of yet, none of you have chosen your path in life. Be ye hunters, or scholars? You must decide, so you may prove your worth to the tribe." "But father, neither path fits us..", Gato began, "we have no need to study new arts, as the scholars we already have are doing that rather well. ", he said, bowing slightly towards the head scholar as he spoke. "And we believe that there is something more to the mares than it seems. " continued Medio, picking up where his brother left off. "We believe that these mares should be studied, so that we may learn more about them." Bahuji looked at his sons in amazement. "MORE TO THEM?!?!" he roared, "THEY ARE MERE BEASTS, MEANT FOR SLAUGHTER, THERE IS NOTHING MORE!!!" "But father, if you'd only listen...", Bajo began, but was cut off. "I'LL NOT LISTEN TO THIS HERESY IN MY HOUSE! THESE CREATURES SLAY OUR BRETHREN, AND YOU WANT TO PROTECT THEM FOR STUDY?!?!?" "Father, if we could learn why.." began Gato. Bahuji's hand swung in a slashing motion, effectively cutting off Gato. Bahuji's voice dropped to a low, barely heard growl. "Your choice is this. Become either a hunter, or a scholar, or leave the tribe. We'll not have worthless baggage, be it my sons or not." Bahuji glowered at his sons. His brow furrowed angrily, as each brother shifted on his feet, and looked questioningly at the others. Gato finally spoke up. "Father, we believe that the mares need to be studied. We will not slay them mercilessly, so we cannot be hunters. We will not research arts to harm them, so we cannot be hunters. Therefore, you leave us with no choice, but to leave the tribe." Bahuji's face flushed, and his strong, well muscled body trembled with rage at the defiance. "Gather your things..." he muttered, barely heard, "and get out of here." "NOW! ", he roared, seeing the brothers pause. One by one, the brothers filed out of the stronghold, with their precious few possessions strapped to their backs. As they walked over the rise, Gato turned back, and looked sorrowfully at his father's house, his only home, for the last time. Then, he turned his back on it, and walked away. Bajo opened the large stone door to the stronghold. The dank smell of stale air flowed into his nostrils, the familiar scent comforting him. He wandered into the chambers of study, finding his brothers there. "Greetings, brethren, I have returned." Gato looked up from the tome he had been reading, and smiled. "Good, I believe that we should now have enough of the essences to begin studying. You did find 12 more, didn't you?" Bajo nodded, sadly. "It is quite easy. All one has to do is follow a hunting party, and pick up what they deem as trash." Medio nodded, and took the sack from Bajo, relieving him of the weight. Setting the pack down, he opened it, and took out the twelve small miniature statue-like essences. He picked up what appeared to be an agoknight, and could almost feel the spirit of the creature contained within. "Okay, my brothers. How shall we go about our study? We all agree that we must rid the world of the threat presented by these creatures." Bajo and Medio nodded, and Gato continued. "It is my personal belief that they should be sent beyond the walls of the dream, so that they may return to the chaos that spawned them. That way, they may be given freedom, and be in their home environment. They are clearly unhappy and confused within the order of the dreamscape, so I believe that they will stay content in chaos." "Brother, if I may interject my belief.." Medio started, and Gato nodded. "It is my belief, " began Medio, "That these creatures are of chaos. I know that we are all agreed on that. However, I do not believe that they will be content in chaos. It is the nature of chaos to destroy order, is it not? I believe that if we did banish them beyond the walls of the dream, they would only re-enter it through another way, in order to complete their goal of the destruction of the dream. I believe that the only way to solve the problem is to imprison their spirits within powerful talismans, to contain the chaos so it does not run rampant." Bajo began to speak, "Brothers, I have travelled the breadth and width of this land in search of essences. I have witnessed many mares in my travels, and have taken time to observe them carefully. I believe that they may be put to use. Just as we would force another dreamer to do chores to teach them responsibility, so I believe that the mares would react in the same manner. We must train them, and make them work for us, as a form of rehabilitation." Gato looked at his brethren. "All good and noble plans, and ideas. None of us can say for sure which view is correct. Time only will tell. I say that we all proceed in studies relating to what each believes is correct, and keep the others updated of any progress we make. Only by study, and sharing our knowledge will the truth be revealed." Bajo and Medio looked at each other, and nodded. "Speaking of knowledge," began Medio, "Shall we look in on the tribes?" Gato nodded grimly. "Let me get the orb." He walked over to a darkened corner of the study, and lifted a dark object. As he neared the brothers, the light began to illuminate the object. It's soft round edges glowed darkly with power, seeming almost as darkness within darkness. It had a small wooden pedestal attached to the bottom of it, as a base. Inscribed upon the bottom were various symbols, symbols of power. Gato set it gently on the table, and spoke mysterious words. The small orb began to glow with an inner light, and slowly began to take form. A face appeared within. "Yes, m'lords? ", spoke the figure within. "Greeting, Balthur, is there news of Calatar's Tribe?" Balthur nodded, slowly. "Word is that his son, Calenture, is looking to usurp him from the throne. There is deep inner conflict within the tribe, and many are looking to other forces for answers." "Thank you, my friend. That will be all." Balthur nodded, and his figure slowly faded away. It was swiftly replaced by another, a female dressed in dark robes. "Greetings, m'lady." said Gato, "Is there news of Ambidar's Kingdom?" The female dreamer smiled, and reported, "Sorry, m'lords. This has been a rather uneventful week. Little has been happening, and many of the members are starting to grow restless. Beyond that, nothing." Gato smiled, and nodded. "Thank you, m'lady, that will be all." They continued this way through all of the tribes. There were no noticeable events going on in any of them, and the brothers felt at ease. "Well, my brothers, let us begin our research!" Many months passed, and the brothers studied laboriously, and tested their theories. Each proved moderately successful, however, neither proved to be the answer that they sought. Gato successfully created the art of "banishment", and could now send mare essences beyond the walls of Underlight. At first, he was overcome with joy and pride, being the first of the brothers to come up with a solution. To test, however, he began to mark each essence with a magical symbol of power, to mark it for it's entire existence. He was dismayed when he went gathering essences, however, as he noticed a few of the mares he found displayed the mark he implanted within it; proof that they did not stay outside the walls. Medio, while daunted by his brothers failure, continued on his project. He finally created the art of "imprisonment" after many months of study, and began to create the artifacts for the essences to be stored in. Finally, with the help of his brethren, he was able to construct three powerful artifacts to store the essences in, and began putting them within. He spent many laborious nights, imprisoning essence after essence, filling the artifacts up to capacity. However, try as he might, it seemed that the mares seemed to eventually be able to escape their prison. He attempted a marking process similar to Gato's and noticed the same inevitable occurrence. The mares were escaping. Bajo also did not meet with a great deal of success. He was successful in communicating with the mares, after finally figuring out their language. He found that by talking to many of them, they would not attack him, but would follow him. He communicated with them, and soon taught them to be able to do simple tasks, such as fetching water, and carrying messages. However, he also observed that over time, their chaotic natures eventually overrode his training, and the mare would attack, or disobey. Finally, one day, Gato gathered the other two into the main study with him. "My brothers, each of us have studied, and come to the culmination of our beliefs. All three have proven inept. However, I believe, given that we all did get minimal results, that we are at least partway on the correct path. Therefore, I believe that it is time we call on the aid of those that would help us. There are many in the dream as dissatisfied with current conditions as are we, and would readily assist our efforts. Therefore, I believe that it is time for us to reveal our presence to the rest of the dream, not just to our spies within the tribes. I suggest that we make a formal announcement in Threshold, and spread our knowledge to others. It may be that we are not the ones destined to make this great discovery." Bajo and Medio looked at each other, and then nodded to Gato. It was decided. The following day found the three brethren walking out of their private stronghold, and meandering down the pathway to Threshold. The appearance of three seldom seen dreamers caused quite a disturbance. These three had not been seen for many years, since they were banished from their tribe, and labelled as outcasts. Upon reaching Threshold, they had gathered already a great number of dreamers following them. Gato stepped up onto a small outcropping of rock, and Bajo and Medio took places at his feet, on either side of him. Gato turned to address the number of dreamers following them. "Fellow dreamers, " Gato began, "My brothers and I are here to tell you of our discoveries. Many of you know that when you kill a nightmare, there is a small statuette left behind. This statuette is the essence of the mare itself, and holds the key to it very being. All of you leave this as trash, and continue onward, not looking back. However, my brothers and I have found that these very statuettes hold the key to removing the threat of the mares from the dream completely." Waves of chatter, and gasps erupted throughout the crowd. They were abruptly silenced as Gato began to speak again. "We have all studied separately, and therefore we will give you our findings separately. I have researched an art known as Banishment. With this art, I am able to send the essence of a mare beyond the walls of Underlight, away from the dream, removing any chance of it being restored here within the dream. It has it's fallacies, however, but I believe that in time, and with much research, we will find a way to keep the mares from ever returning. Maybe if we can ever have all the mares banished at one time, they will stay gone. Only time will tell. Next, I present my brother Medio." Gato stepped down, and relinquished the makeshift pedestal to his brother Medio, who stepped up, and began to speak. "Fellow dreamers, while my brother was researching his art of banishment, I took a different approach to the mare problem. My method involves imprisoning an essence within an artifact created to store them. This will keep them from being restored here, and keep them from coming back from chaos. However, my art is not perfected either, as occasionally the mare will escape the artifact. I believe that in time, and with study, this problem will be resolved as well. Now, I present my brother Bajo." Medio stepped down, and turned the outcropping of rock to his brother, who anxiously started to speak. "Greetings, my friends. I took a radically different approach to this than my brothers. We all know that with work comes responsibility. I studied many nightmares, and was able to divine their language. With this knowledge, I was able to communicate with them, and teach them to do simple tasks. This responsibility seemed to give the mare a purpose, to give it some sort of reason for being. This seemed to calm down the mares, and make them more sociable, and not as eager to attack. However, as with my brothers, I did not meet total success. After a time, due to their chaotic nature, the mares would eventually resort back to their old habits, and attack." Bajo stepped down, and Gato stepped back up. "My fellow dreamers, we all seek your help in perfecting our solutions. We have taken our studies as far as they can go, and now turn our focuses in other directions. I believe that one day, we will be able to rid the dream of the mare threat forever." Gato bowed, followed shortly by his brothers. The three then stepped though the crowd, which parted before them, and returned to their stronghold. Many days later, the brothers once again assembled within the study. Gato sat the orb on the table, and began to evoke the art used to activate it. Balthur appeared, his calm face appearing haggard, and frazzled. He smiled as he looked at the brothers, and began to speak. "Well, m'lords, I hope you know what an event you've started off. But seeing as how you seldom pay attention to many events outside your stronghold, I shall inform ye. After your speech in Threshold, the dreamers all ran back to their individual tribes, and massive upheavals began. Speaking for this house, Calenture was able to overthrow Calatar, and is now in control of the tribe. In fact, he renamed the tribe house Calenture, and took residence deep within Evernight Plateau. He has constructed a huge stronghold, and now has many followers flocking to him from all corners of the dream. He has taken your art of banishment to heart, and now requires that all of the hunters in the house pick up any essences. As you recall, Gato, I asked you to teach me banishment but two days ago, and now have taught it to Calenture himself, along with the other rulers of the house. The only problem is that he is dead set against imprisonment, and has demanded that his followers destroy any people they see imprisoning essences." Balthur sighed sadly at this point. "This causes a great deal of conflict with the other houses, especially the newly formed Dreamer's of Light. But, I'll leave that to Mystique to explain." He smiled mysteriously, and continued. "Well, m'lords, that is about all of the noteworthy occurrences. Calenture bows to you, Gato, and will assist you in studying and practising your art. Thank ye much for giving this tribe some direction." Balthur slowly faded, to be replaced with the figure of Mystique, smiling widely, and straightening her dark purple dress as she appeared. "Greetings, m'lords, ", she began, "I believe that you have more than likely talked to Balthur, so you know of the current relations between our two newly formed houses, one of pure animosity. The same ordinance has been placed in inverse for this house; any banishers are collapse on sight." Mystique sighed. "Ah, me, well, the dream will work out eventually. A guardian named Wraith usurped control from Ambidar, and is the ruler of this house now. He is a fierce warrior, and a strong ruler. I believe that they will do well under his rule. Alas, that is all of the news for now, m'lords. The Dreamers of Light thank you for their inspiration, Medio." Mystique curtsied formally, as she faded from view. Continuing down through their contacts (generally referred to as spies), they found that many new houses had formed, and all held strictly to one of their three new beliefs. Gato smiled. "Now that there are many minds thinking of the subject, instead of only three, I'm sure we will soon see results. Until then, let us return to our studies." A period of eight months passed, with neither brother venturing out of Threshold. Each sat apart, and studied endlessly, and researched varying theories. Meanwhile, the houses grew strong, and began to war against each other, regarding their beliefs. Calenture and Wraith became great enemies, and their constant warring shook the dreamscape. Dreamers lived in constant fear, living in eternal fear of being collapsed for their beliefs. The once peaceful dreamscape had turned into a war ravaged land. The brothers were greatly bothered by this, as their quest for knowledge had turned into a reason for war. This only prompted them to study harder. Then, one day, Medio called his brothers together. "Brothers, I believe that I may have at last found the a solution. We have all diverged on our own paths, and overlooked to obvious. We must join our efforts, in a process I have just started experimenting with. This process that I have thought of involves joining all three of these processes. First, we have all noticed the incredible amount of similarities between the mare essences, and the dreamer essences. The main difference is that dreamer essences is that the substance of dreamer essences is in an ordered pattern, whereas the mare substance moves about randomly in a chaotic pattern. I believe that if we can order this substance, that we will be able to remove the mares from the Underlight forever." "It sounds promising, my brother." said Gato, "Have you come to any success as of late?" Medio nodded. "Yes, my brother. Allow me to explain the process to you. First, I studied the maren dictionaries of our brother Bajo, " he said, nodding in his brother's direction, "and I practised his method of training the mares. I noticed that when they are trained, their chaotic nature begins to gain some semblance of order, and that is key to my plan. I believe that if we can order a mare's essence, that they will cease to be what they are, in effect. My plan is thus. First, we train a mare, and get them to obey, to start the process. Then, we imprison them within an artifact, as to directly work with the essence itself. This is where my new art, ordering, comes into play. With it, I directly continue the changes started by the slavery. Using this, when coupled with the initial slaving, will completely order the mare' s essence. Then, afterwards, we banish the essence beyond city walls, as order instead of as chaos. My plan is that over time, the order we send into chaos will eventually take over, and possible create a boundary of order around the dream, disallowing any more of the chaotic mares to enter. Tis much like the way that matter attracts to itself, in a way, I believe that the order of Underlight itself will attract the order that we send out, creating the shield." A look of wonderment passed over Gato and Bajo's face. "My dear brother, I believe that you have the answer! ", said Gato, a grin beginning to spread across his usually stoic face. "Have you tested it out yet? ", he asked excitedly. Medio smiled. "My dear brother, would I have brought it up before you two if I had not?" Bajo let out a nervous laugh. "We did it. We....we..."
Gato joined in, the stress and urgency of the past many years wearing away at the final success. "Yes, my dear brothers, WE DID IT!!!" In that one instant, the brothers joined together in merry laughter, the likes of which had not been heard in the stronghold in a long time. The walls rang with the joyful sounds, as the brothers celebrated their victory. And, for perhaps the first, last, and only time in their lives, the brothers were joyful and at peace. Mere hours later, the brothers sent messages through all their contacts to gather the dreamers, and have them come to the stronghold to hear their joyful announcement. As the brothers finally opened the stronghold door to give their report, they were amazed at the number of dreamers whom had gathered to hear their words of wisdom. House differences were set aside while the brothers were present, although animosity within the crowd could still be sensed. Looking down the middle, Gato spotted Wraith and Calenture, standing side by side, yet with their hands on their blades. At one time, they were quietly saying, "I will tolerate you for a reason, but I will kill you in a second for even the smallest reason." They were the perfect example of how you wanted to keep your friends close, and your enemies closer. 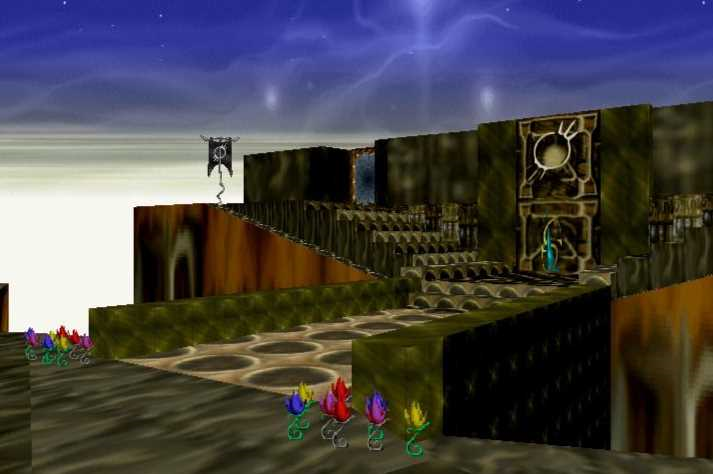 Gato stood upon the stairs of the stronghold, with Medio and Bajo on either side of him. He began to speak to the assembled dreamers. "Dreamers of Underlight, eight months ago, we came to you with our ideas on how to rid the dream of the nightmares. You have all studied and practised the arts we discovered, and made available to you. However, eight months of research has blessed us with a better method of dealing with the mares. My brother, Medio, was the one granted this knowledge, so it is only fitting that he should be the one to discuss it with you." As Gato stepped down, and Medio took the pedestal, rustles and murmurs could be heard throughout the crowd. "Better then imprisonment? But it works...."
"I don't like this...I think that..."
Medio began to speak, and the assembled dreamers quieted. "Fellow dreamers, as we told you before, there are still problems with the processes we described to you. Banishment is not a temporary fix, as it has been proven that the mares can and do return to Underlight after being banished. Imprisonment's weakness is that it has been proven that the mares can escape from the artifacts after a time. Slavery does not work, as it has been proven that the mares training fails after a period, and they strike out." Murmurs rustled throughout the crowd again, but Medio raised a silencing hand. "We have a solution, however. It involves joining the three processes together, and adding another new process." "I'll never join forces with a banisher! ", shouted Wraith angrily. "Imprisonment is WRONG! ", yelled Calenture, "It's unsafe, and must be destroyed!" All the assembled dreamers began shouting comments at the brothers. Medio glanced nervously at Gato, who raised his voice above the crowd. "FELLOW DREAMERS, IF YOU WILL BUT LISTEN TO MY BROTHER.." he shouted above the low roar of the dreamers. "They are POSESSED!!! ", shouted Wraith, "They have been consumed by the very essences that they were trying to destroy!!!" "They're trying to stop us from practising, so the mares will stay here forever!! ", shouted Calenture. "Yes, they are possessed! They must.."
"They must be killed before they can harm the dream!!" Gato grabbed his brothers, and pulled them back inside the stronghold before the mob could reach them. He braced the door, and swung the stone bar down to lock the door shut. Breathing heavily, he turned to his brothers. "I cannot believe it...I simply cannot believe it..."
"We should never have taught them the initial phases...", Medio said sadly. "My dear brother, we couldn't have known they would react this way. ", Bajo said. "Yes, all dreamers have been affected by this constant warring. They have grown distrustful. It more than likely would have eventually happened even without us introducing them to our beliefs." Gato replied, softly. The brothers looked at each other, with every face filled by sadness, and regret. They stood this way, in sadness, for over an hour, in retrospective thought. A knock resounded at the door. The brothers looked at each other nervously, and Gato called out, "Who is there?" A familiar voice answered, "It is I, Balthur, and Mytique." "No, my friend, they returned to their war. You are temporarily forgotten." Gato lifted the latch, and admitted their two spies. After they entered, Gato consciously lowered the latch again, and turned toward them. "Ahh, my friends. It is good to see a friendly face again." "Yes, m'lords. We heard about the situation, and rushed over as soon as we could. We missed your speech today, but we were curious what you said to get them all riled up." "Medio, would you kindly repeat your process for them?". asked Gato. Medio complied, and Balthur and Mystique listened thoughtfully. Afterwards, Balthur turned to Gato. "M'lord, would we be able to see your notes on the study?" "Yes, most assuredly. I will go fetch them." Gato rushed down the hall, glad to have something, however temporary, to take his mind off of events. Just as he entered the study, he heard a shriek from the hall, followed closely by another. He stopped in his steps, and froze. He didn't have to turn around. He knew what was happening, even before the blade was pressed against his throat. "Any last words, m'lord? ", Balthur asked, statistically dragging out the last word. "I'm.....sorry....", Gato said, as Balthur slid the blade across his throat, killing the last brother of the trinity. He turned to Mystique. "They were right... they must have been possessed. The plan they mentioned... it was completely stupid." Mystique nodded. "It made no sense, unless there was something that we all missed." Balthur shook his head. "I think not, m'dear. After all, they worked with chaos their entire life, it was inevitable that they should eventually be consumed by it. I'm surprised that it took this long." Mystique looked at the crumpled corpse of Gato, and at Medio and Bajo, laying at the end of the hall. "Yes, my friend, they had to be killed to free them of evil." "Sable Moon" represents the order, it was almost first opened as a dark house that drew power from mare essences. The black moon served as that evil. Now it represents the whole dreamer. The six points make up the variables of the dreamer. The top three stand for mental, physical, and emotional. The bottom three on the emblem stand for lust, greed, and hatred. The idea is that while we strive for perfection in the dream, each dreamer has parts in them which are truly evil and parts which are truly good. This page was last edited on 19 March 2019, at 22:59.